PHOTO: Paul Barnes, president of Shea Homes in San Diego ,presents El Cajon historian and author Eldonna Lay with a check for his firm’s lifetime membership in the El Cajon Historical Society. The two stand behind a historic marker installed by Shea Homes to commemorate the adjacent ancient site of El Granito Springs that once flowed beside the high granite ridge along Avocado Blvd. Photographer: archivist Mike Kaszuba, El Cajon Historical Society. 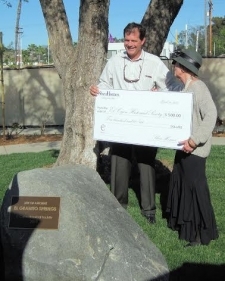 April 16, 2015 (El Cajon )--The boulder and brass plaque requested by the El Cajon Historical Society honors the ten thousand years or more that El Granito’s spring waters were used by tribes of local and far-flung Indian nations traveling between the desert and the Pacific Ocean shores.